Microsoft Exploring Other Zune Orignals Designs? 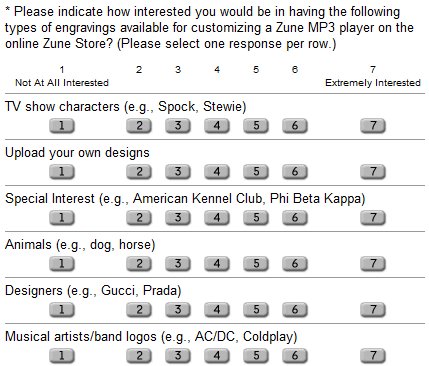 I received a survey tonight, on behalf of Microsoft's Zune group, asking me questions about my experience ordering my Zune Originals Zune, a red Zune 80. Most of the questions were quite mundane, asking me about my thoughts on the ease of use of the site, speed of ordering/shipping, etc. The one question that caught my eye is shown above: Microsoft is obviously guaging reaction to the idea of doing new Zune Orignals designs. Trimmed out of the screen shot were other options, including popular brands (Adidas, Burton, Pepsi), gaming (Sonic, Mario, Halo), cartoon/anime (Naruto, Spongebox Squarepants), colleges (Duke, UCLA), professional sports teams (NFL, NBA), and movie characters. I think the ability to upload your own design would be a killer addition to Zune Originals - people could have a lot of fun with that!